You can find the spotted hyena in sub-Saharan Africa, especially in the Serengeti plains and Ngorongoro Crater areas of Tanzania. 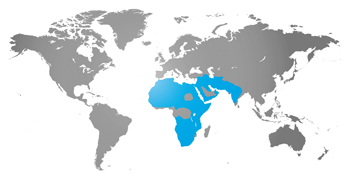 They prefer the open, dry climate of semi-desert, savannah, and mountainous forest areas of Africa. Hyenas will prey on small mammals, birds, lizards, snakes and insects, but they will also hunt larger hoofed animals such as wildebeest or antelope. We feed them a carnivore diet and bones at the Zoo. Spotted hyenas live in groups called clans. Clans, which are led by females, may have up to 80 hyenas. Spotted hyenas are fast runners and can run long distances without tiring. They work together to isolate an animal and chase it to its death. They often kill large mammals such as a wildebeest or antelope, but they are also scavengers, eating the leftovers of other predators. Hyenas are one of the noisiest African animals. They’re sometimes called laughing hyenas because of their high, cackling laugh. But you’ll only hear this sound when a hyena is being chased or attacked. How often are baby hyenas born? Females are capable of producing a litter an average of every 16 months. Spotted hyena offspring are independent by 18 months. Hyenas have a sandy, yellowish or gray coat with black or dark brown spots. The spots are darker in younger animals.